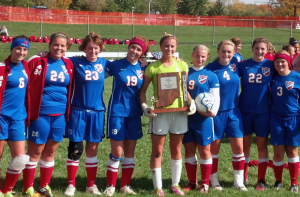 The Kokomo Lady Wildkats soccer seniors hold the IHSAA Class 2A Logansport Girls Soccer Sectional championship trophy. A trio of Howard County teams hoisted hardware on Oct. 6, including a pair of IHSAA sectional trophies. The Kokomo Lady Wildkats claimed the IHSAA Class 2A Logansport Girls Soccer Sectional with a 3-2 upset victory over North Central Conference champion Marion. Spencer Wesche had the game-winning goal on a feed from Cheyenne Eltringham with 20 minutes left. Taylor Coram and Bre Kinder had the Lady Kats (13-5-1) other goals while Becca Wade had the win in goal. Earlier in the season, Marion topped the Kats 4-1. The win marked Kokomo’s first sectional title since 2010 and eighth overall. The Lady Kats also won a regional title in 2002. Kokomo advances to the IHSAA Class 2A Logansport Regional where it will play the Noblesville Sectional champion and No. 2-ranked Hamilton Southeastern (17-2-1) in the second semi-final on Wednesday at 7 p.m. Yorktown (11-6) battles McCutcheon (11-8) in the 5 p.m. opener. The winners play for the regional championship on Oct. 13 at 1 p.m.
For the second straight season, the Northwestern Tigers are kings of the IHSAA Class A Tipton Boys Soccer Sectional after they defeated Taylor 4-1 to claim the crown. Robert Olsen led the Northwestern offensive attack with a hat trick while Jacob Wagner added the insurance goal on a penalty kick. No. 23 Northwestern (15-2) advances to the IHSAA Class A Tipton Regional, where it will play Crawfordsville (12-6) in the first semi-final game on Oct. 11 at 5 p.m. The second game matches No. 1 Guerin Catholic (16-0-1) against Muncie Burris (15-2). Guerin knocked the Tigers out of the tourney a year ago. The winners play for the regional title on Oct. 13 at 7 p.m. This is sixth sectional trophy for the Tigers program. They were regional champions in 2002. The Lady Tigers of Northwestern downed Eastern 25-16, 25-16, 25-20 to win the Howard County Tournament. Emily Harshman led the Tigers (10-12) with 10 service points in the title game, while Hannah Treadway added three aces and six blocks. Hannah Ballard also played well in the championship game with eight service receptions and eight digs. For Eastern (10-17), Lizzy Mavrick had 29 kills and 20 digs. In the semi-final round of the tournament, Northwestern beat Western 25-8, 20-25, 25-11, 25-18 while Eastern eliminated Taylor 25-15, 25-10, 25-13. This entry was posted in High School, IHSAA, Kokomo, Lady Kats, Northwestern, Sectionals, Soccer, Volleyball. Bookmark the permalink.